General Election Day occurs on the first Tuesday after the first Monday in November. United States senators and congressmen are elected every two years, in even numbered years. The presidential election occurs every four years in years divisible by four (2000, 2004, 2008, 2012, etc.). Elections held in odd numbered years are often used for local mayoral elections and other municipal offices and citizen initiatives. The Tuesday after the first Monday in November was initially established in 1845 (US Code Title 3, Chapter 1) for the appointment of Presidential electors in every fourth year. US Code Title 2, Chapter 1, Section 7 established this date for electing U.S. Representatives in every even numbered year in 1875. Finally, US Code Title 2, Chapter 1 established this date as the time for electing U.S. Senators in 1914. Americans observed the first uniform election day on November 4, 1845 in accordance with Congressional legislation passed earlier that year. The law, which ensured the simultaneous selection of presidential electors in each state, increased the power of political parties and reflected the democratization of presidential politics which had taken place since 1820. As late as 1816, the citizens of nine states did not vote in presidential elections. Instead, previously elected state legislators chose the presidential electors who then determined the outcome of the contest. 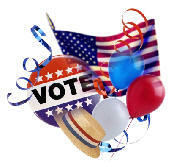 Voting and Elections - Official information and services from the U.S. government.